The Rebel Sweetheart. : Teen Mom Jenelle Welcomes Baby Girl! Teen Mom Jenelle Welcomes Baby Girl! Teen Mom's Jenelle Evans welcomed baby girl Ensley on January 24, 2017. Evans is already mom to two boys, Jace, age 7 with ex Andrew Lewis, and Kaiser, age 2, with ex Nathan Griffith. This is Jenelle's first baby girl, and she is definitely beautiful. The Teen Mom star shared some adorable photos of baby Ensley along with boyfriend David Eason. 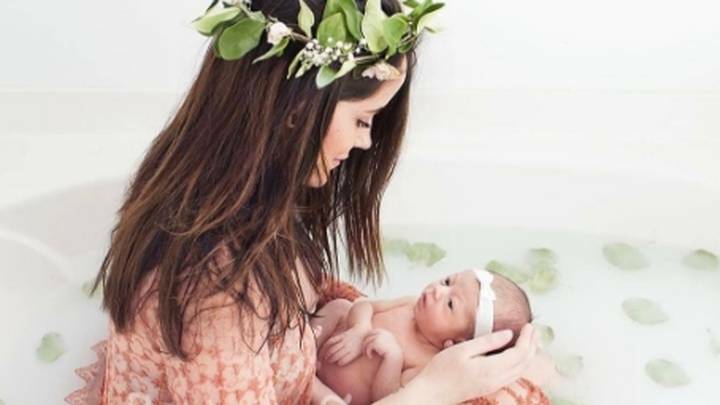 Several photos showed Jenelle holding Ensley in a milk bath, and some featured David and Jenelle snuggled in bed with their new baby girl. It's so nice to see that things seem to be calming down for Jenelle. Sources say that the reality star had a stressful delivery. Jenelle's mom, Barbara, even claims that Jenelle's boy friend David kicked her out of the delivery room, a claim that Jenelle has adamantly denied on Twitter. It's also a busy time for the couple as they build their dream home, and as Jenelle continues to battle her mother for custody of her oldest son, Jace. The next hearing in the custody battle is scheduled for the end of May. It's such a busy and exciting time for Jenelle, we hope that she is able to sit back and enjoy her beautiful new baby girl! All these teen moms are popping out kids and I am over here like.... Oh hey, look at that cute giraffe youtube video. Wow, she's a teen and already has a 7-year old?! I'm 30 and I couldn't imagine having a kid yet! I hope everything works out fine for her. She's gone through so much in such a young age. But then again, age does not have anything to do with it. You can be mature and responsible at 15 or irrational and immature at 45. That's such a lovely picture! I am not familiar with Janelle. Is this from the Teen Mom Show in MTV? Sounds like she's in a lot of stress because of the custody battle but I do hope everything goes well for her. That photo is simply beautiful. i hope everything goes well for her. at her age she should have enjoying her teen age life. i wish her all the best! I'm really glad that she can handle that situation while still a teen. Spotlight | Clio Kill Brow Auto Hard Brow Pencil. Fashion Pulse | 4 Dresses Every Woman Should Own. 7 Budget Travel Tips for Students.